I remind you to fan into flame the gift of God, which is in you through the laying on of my hands, for God gave us a spirit not of fear but of power and love and self-control. Everyone has little fears in life. They can be downright silly: I have a good friend who is an outdoorsman and loves to hunt and fish, but he is deathly afraid of . . . daddy longlegs spiders! There cannot be a more harmless creature on earth, but if he sees one, he jumps back five feet. This little phobia doesn't do any real harm to my friend. But similar fears of bigger things in life, often hidden behind rationalizations, can cripple us and keep us from doing what God means us to do. Fear of failure, fear of rejection, fear of being criticized by other people is a big one, because we almost all share this fear to some degree, or in some instance. 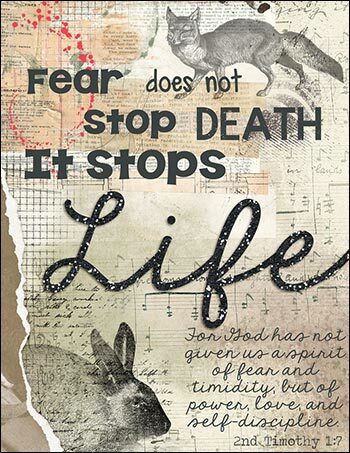 Fear can be our friend, if it stops us from driving 120 m.p.h. or from picking up a strange snake; but like every part of our mind, Satan uses it to his advantage every chance he gets. And fear of ridicule, rejection, and failure, when it stops us from proclaiming the truth of Christ's message, is one of the devil's favorite friends. But the great cure for this fear is given to us in the Spirit, and that cure is love. How much more can you love someone than to tell them about Jesus? What would you think of yourself if you began to witness, and nine out of ten people laughed at you and called you stupid — but one out of the ten wanted to know more? Well, that's pretty much the experience of most people who testify to nonbelievers. Some people are actually interested in hearing about it; they are called to believe, but they are as shy about it as others might be about talking about it. I will leave you with a story about Billy Graham: He was invited to give a series of lectures at Oxford University and, yes, even Billy Graham was a bit intimidated. But he did his best, for the first two lectures, to speak at a level of intellectualism that would be appropriate. And the hall was full, and the crowd applauded politely. But he realized, he was getting nowhere. He wasn't a don; he was an evangelist. So for his third lecture, he let them have a full-on sermon about the Blood of Christ: gritty, gut-level evangelism. And on the fourth night, two-thirds of the seats were empty. Only 400 people showed up. He had driven away most of his audience. But the people who did come? They were 400 people who were hungry for Christ. And while the no-shows sat in pubs and laughed about the dumb American preacher, the 400 souls who did show up found eternal salvation. Lord, take away my irrational fear so that I might proclaim you with boldness. Amen.